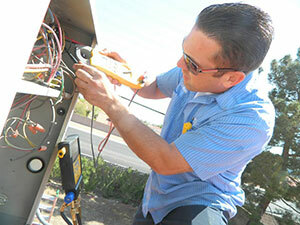 When you need expert Las Vegas air conditioning repair service in a hurry, Air Doctor is at the ready. Air conditioning systems usually don't warn you about an impending breakdown. Especially during the sweltering Las Vegas, NV summers, it’s never a good time when they stop working properly. Our highly-trained technicians will be out to quickly diagnose the problem and perform all the needed repairs. At Air Doctor, we never sleep. We're here for you 24/7 with emergency Las Vegas air conditioning repair to put you back in your comfort zone! Our savvy technicians can correct any kind of air conditioning problems and they'll bring everything they need to do the job right. No matter what kind of cooling system you have, the Air Doctor crew is qualified to fix it. Our Las Vegas air conditioning repair service vehicles are fully stocked with all the necessary parts and equipment, so there's no waiting around and no wasted time. Is Your Air Conditioner Working Properly? Air conditioning involves both cooling and dehumidifying. As such, it's a system of refrigeration. Your residential A/C system may be centralized with duct work that transports cool air to every room or it may distribute cooled air to multiple units within one building. Our certified and registered technicians are all highly qualified professionals who receive ongoing training and continuing education. They thoroughly understand the complexities of today's cooling systems and are highly qualified to pinpoint the source of any problem. They are assisted by the latest in modern technologies and bring extensive knowledge about advanced repair work to every problem. If it's possible for your cooling system to be fixed, we'll fix it! On the other hand, some older air conditioning units are just not worth fixing. If repairing an old, inefficient cooling system will just cost you money in the long run, we can replace the old air conditioner with a new energy-efficient system. We provide free written estimates for all proposed system replacements. With regular Las Vegas air conditioning service to maintain your unit, you can prevent many cooling system breakdowns and avoid disruptive emergency repairs. With Air Doctor's air conditioning maintenance program, you can minimize the possibility of repair work, save on cooling costs and keep your system performing optimally for a longer period of time. When you need prompt, professional, honest and affordable Las Vegas air conditioning repair service, call Air Doctor Inc. We've been fixing a/c systems for 20 years without a single complaint. Our stellar reputation as a Las Vegas Air Conditioning contractor is without equal and our outstanding customer service is second to none!